This is Part 3 in a three-part series. To read Part 1, click here. To read Part 2, click here. The world has lost perspective. We’ve devoted ourselves to the pursuit of greater efficiency and increased production apparently without giving thought to why such a pursuit serves our own interests. We’re quite literally asking the wrong questions, each based on a faulty assumption. We ask these things without first verifying that they’re even necessary. In effect, we seek more food without ever asking ourselves if we’re hungry. Corporations have been built, self-help books written, and an army of young workers raised to continue the wanton growth we’ve come to believe is necessary for civilization to flourish. We’ve done so in vain and the results will be far different than expected. Humanity has given itself over to greed, a greed which neither satisfies its seminal cause nor accomplishes its declared end. What’s more, the First World stands poised to repeat the mistakes of empires past by allowing its greed to create an unsustainable reality which will lead to inevitable decline. “I’m the author of a famous hypothesis, the threshold hypothesis, which says that in every society there is a period in which economic growth, conventionally understood or no, brings about an improvement of the quality of life. But only up to a point, the threshold point, beyond which, if there is more growth, quality of life begins to decline…. There will come a point when humanity will be forced to ask itself where it has been going. It’s a simple question, really: Where are you going? Yet, in a wide-spectrum view of all people, it’s impossible to answer. The mistake that so many have made is to believe that work is a journey to a particular destination. The reckless rat race for boundless efficiency and productivity will lead only to ruin, which is why we must, as a civilization, reexamine the reasons we work and pursue wealth. Resources are not limitless and the day will come when all Men will be forced to acknowledge that our current model of civilization will not last forever. Unless we come to that realization now and make the necessary changes to ensure that we have sustainable prosperity, we will be taking a plunge into the unknown, one from which we may not return. Human beings were not created to be cogs in some vast economic machine. The mere notion of regarding humans as “capital” is offensive to their divine nature and a flagrant disregard of the underlying reasons people live and work. We do not live to work; we work to live. Once we’ve planted that realization in our hearts, it might just begin to make sense to us why a little woman in a remote village saw greater value in more time spent with those she loved than in 18 extra ponchos. This is Part 2 of a three-part series. To read Part 1, click here. To read Part 3, click here. Remember the theory I put forward about why the Roman model of civilization failed? While I have no intentions of playing the game “Pin the Tail on the Reason Rome Failed,” an undeniable reason was simply because the empire became unsustainable. The Romans couldn’t maintain the relentless conquest and expansion needed to feed the monstrous economic engine it had created. Sure, the lead pipes and barbarians also played a role, but, still, the simple truth is that Rome reached its technological limit during the reigns of the emperors Hadrian and Trajan and, resultantly, was unable to meet the challenges it faced in the latter part of its history. In case it isn’t clear by now, I’m trying to draw an analogy between Rome and the Twenty-first century First World in this regard. There will come a point when civilization will reach some sort of limit that cannot be overcome. More likely than not, that limit will be environmental in nature. In other words, there simply won’t be enough resources to meet demand. We see harbingers of that at present: the depletion of global fossil fuel supplies, the felling of the world’s oxygen-producing rain forests at a horrific rate, the acidification of the oceans due to the increased carbon in the atmosphere, and the list goes on. Human beings are being confronted daily by the fact that the Earth is not an infinite source of resources and raw materials; there are limits to how much we can exploit it to satiate our own greed. Whether of our own volition or if we eventually run up against the Earth’s own natural productive boundaries, that exploitation will end. For our sakes, we should probably do something about it now while we can still take measures to ensure the continuity of our prosperity. I previously asked if continual growth was a good thing and left the answer ambiguous. It depends, I wrote, on the ultimate reason why men work and produce goods. I’d like to discuss that further now. Manfred Max-Neef is a Chilean-born economist who teaches at UC-Berkeley. In an interview last fall with Amy Goodman on the independent news show Democracy Now!, he related a story that beautifully illustrates the issue I’m getting at. He told of a group of Peace Corps workers in South America who come across a woman in a remote village. This woman has a machine that allows her to make two ponchos in week that she then sells to make a living and provide for her family. The Peace Corps workers tell her they could give her another machine that would allow her to make twenty ponchos a week and, therefore, more money. The woman gladly accepts the machine and the group leaves. The Peace Corps workers are incredulous and tell the woman she could be making much more. The woman replies to this by saying she doesn’t need to make more. “But what good is the machine if you aren’t making more?” the flabbergasted Peace Corps workers ask. Contained in this little parable is a picture of the great tragedy of our time. We’ve ironically come to value the tools more than the project, the road more than the destination, the labor more than its fruits. “For where your treasure is, there will your heart be also,” said Jesus in Matthew 6:21. The woman’s treasure wasn’t in making more ponchos and increasing her socioeconomic status. Her treasure wasn’t in her work but in people. The fruit of our labor should be the means to live. The means themselves have virtually no intrinsic importance; they are the mere tools we use to enable us to live. Food, drink, shelter, they are all meaningless without people to share them with and if a quixotic quest to get more of these things has surpassed in importance the act of sharing them, then we’ve lost perspective. Indeed, we’ve ceased to live. The Roman Empire at it’s height. This is Part 1 of a three-part series. To read Part 2, click here. To read Part 3, click here. Many learned men smarter than me have sought to explain why the Roman Empire fell. Some have blamed the lead pipes they used to carry water to the upper rooms of their houses and others have said it was due to the invading barbarian hordes being driven westward by the Mongols. And still others attributed Rome’s decline to the over-specialization of the Roman elite and their dependence on imports and subsidies from the provinces. Edward Gibbon interestingly placed the blame on the Christian Church. Now, from my perspective, it doesn’t appear any of these or any of the dozens of other popular theories are right at the expense of the others; in short, all of them played some part, however big or small, in the decline and fall of Rome’s empire. My own theory is a mixture: namely that as Rome’s power spread further and further from the city itself, the technological limitations of the day–primarily the speed of travel and communication–created a system which was unsustainable. Furthermore, the continued success of the empire was intimately dependent on continual expansion and conquest in order to supply the flow of human and economic capital needed to maintain the prosperity to which the Roman upper classes were addicted. As these conquests and the empire itself became ever more expensive to maintain, its eventual collapse was really inevitable. Actually, to say that Rome collapsed is somewhat inaccurate; it would be more appropriate to say that when Odoacer compelled the abdication of the emperor Romulus Augustulus in 476 A.D., it was the mere snuffing out of one of the empire’s last flickering embers in the west. 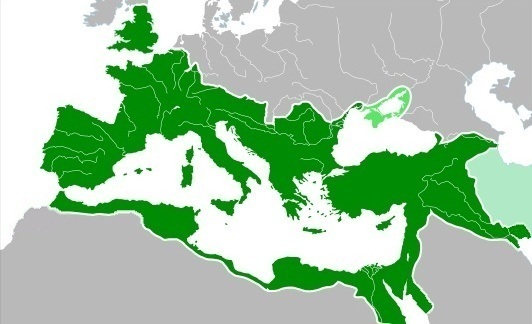 The eastern half of the empire would of course continue until 1453, though it was only “Roman” in an esoteric sense. So many people have spent so much time pointing out similarities between the modern First World (primarily the United States of America) and Imperial Rome that it’s become cliché. In fact, labeling the comparisons cliché is itself cliché. Even so, I’d like to take a moment and make such a comparison, hopefully in a somewhat new and fresh approach. The 235-year history of the United States has been one of explosive growth. In less than two and a half centuries, a small, rag-tag conglomeration of sparsely-populated colonies became the wealthiest nation in the history of the world. Even in the course of human history (let alone natural history), 235 years is a tiny blip. The U.S. led the way in many of the technological developments of the last century and has created a quality of life and a standard of living that surpasses any historical precedent. Average earned wages increased every decade for a hundred and sixty years from the 1810s. But, not just the U.S.: this prosperity has engulfed nearly the entire Western world. And that, I submit, is the problem. Allow me to explain: growth and prosperity are not intrinsically the problem; rather, they are the primary symptoms of the real underlying issue, which is that the First World has a blind, almost religious devotion to growth. Consider for a moment the indices used to measure economic health. We’ll use the example of gross domestic product, which is the monetary value of all final goods and services produced within a country over a period of time (in most cases, a year). In 2010, the United States GDP was roughly $14.7 trillion. At the very real risk of over-simplifying a highly complex concept, it is generally considered bad when that number decreases and good when it increases. Politicians lament the loss of output and boast when production goes up. People who spend any time at all listening to most of the leading voices of today on matters such as this will hear an almost maniacal obsession with growth, increased efficiency, greater output, et cetera. But, there’s one question they all seem to have forgotten—or neglected—to ask: is continual growth a good thing? I can only imagine the blank stares I would receive if I shouted that question in a room full of businessmen. To them, I assume, it would probably be the height of stupidity. Nevertheless, the question needs to be asked because it forces us to examine why we work and why we produce. What, exactly, are we working for? For what purpose, ultimately, are we producing these goods? The answer isn’t a number, it isn’t a monetary sum, and it isn’t an efficiency ratio. It strikes at the root of the modern philosophical understanding of work. My assumption is that most current economics courses offered at universities are meant to equip students to succeed in the current economic model; no one, it appears, is stopping to ask if the current model is the right one. So, is continual growth a good thing? Well, that depends. There isn’t a right or wrong answer because it’s a values judgment and, therefore, subjective. That concept is going to be revolutionary to many people; we’ve arguably become so immersed in the endless quest to preserve or improve the status quo that we’ve neglected to step back to see whether or not the system is doing what it was intended to do. It will be that appraisal, more than anything else, that determines how human civilization moves forward.